With 1:42 left in the game, Ohio needed to score again. Massachusetts was still within reach. On third down, at the Massachusetts 42-yard line, running back Dorian Brown dashed any doubt. Brown rushed for a 42-yard touchdown, and UMass was done. 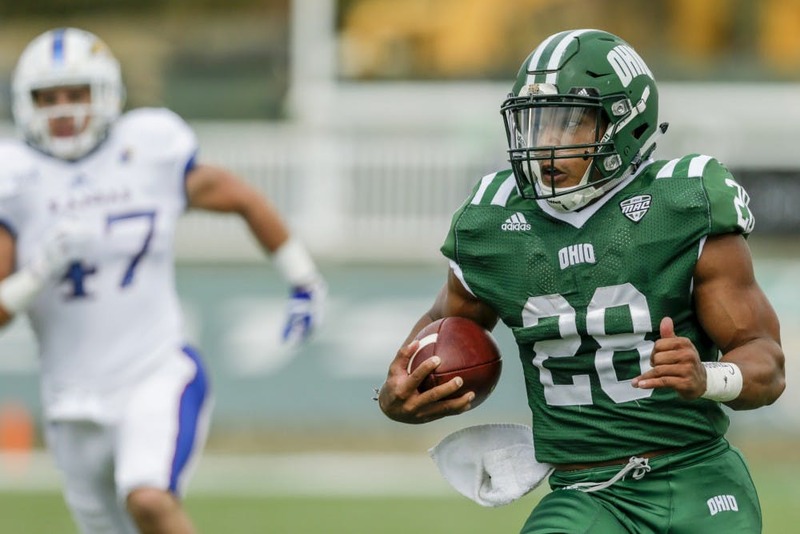 Ohio’s rushing attack stifled UMass on Saturday en route to a 58-50 win at McGuirk Alumni Stadium. Brown, A.J. Ouellette and Nathan Rourke led the Bobcats’ multi-pronged rushing game, but Ouellette contributed the most. He rushed for 125 rushing yards and a touchdown. Along with the rushing touchdown, he also caught a pass for touchdown. For a third straight game, Ouellette — who is ranked No. 2 in the Mid-American Conference for rushing yards — totaled 100 or more yards on the ground. Ouellette is thriving, and Ohio’s offense is, too. In their past two games, the Bobcats’ rushing game has been the reason for their success on offense. Ohio has rushed for an average of 219.6 yards per game in the past three games. It’s the No. 2 rushing offense in the MAC for a reason, what with its depth. Ouellette had a 60-yard run at the beginning of the fourth quarter, which set up a Brown touchdown that put Ohio up 47-29. Ouellette and Brown combined for 197 rushing yards, but another 113 didn’t come from a running back. It came from Nathan Rourke. “I think he’s starting to show people that he has the ability to do some special things,” coach Frank Solich said. Rourke has repeatedly shown his ability to evade the pocket, and even to gain extra yards after contact. The Bobcats (4-1, 1-0 MAC) have a dual-threat quarterback, which only makes for an offense that is markedly different from last year. It’s unpredictable, but it thrives on the one component it needs to: the run game. “Once we get a running game going, the passing game coming off of it, we can be effective,” Solich said. Rourke didn’t eclipse 10 pass attempts until the second quarter, and he still finished with two passing touchdowns, two rushing touchdowns and 294 total yards. While the Bobcats have reason to be satisfied about their offensive output this season, they have reason to be concerned about their defensive performance against the Minutemen. Ohio gave up 50 points, the most it has given up this season. “I don’t think any of us are satisfied with 50 points on the board by the opponent,” Solich said. As the Bobcats finish their two-game road trip, they will play Central Michigan at home next Saturday at 2 p.m. The Bobcats lost 27-20 on the road against the Chippewas last season.